Rumor has it that in an upcoming interview with Oprah Winfrey, Lance Armstrong will make a “limited confession” to using performance-enhancing drugs during the time period when he won the prestigious Tour de France bicycle race for seven straight years from 1999 to 2005. If so, this would be a major about-face for Armstrong, who for years has actively and vociferously denied charges of using performance-enhancing drugs. He has even gone so far as to aggressively pursue both defensive and offensive legal action against individuals, publications, and organizations that have publicly charged him with doping. However, the tide began turning against him when in June 2012 the United States Anti-Doping Agency (USADA) formally accused Armstrong of doping. In August 2012 USADA released a damning 202 page report providing extensive eyewitness and documentary evidence of Armstrong’s doping. As a result of the charges and the supporting evidence, Armstrong was stripped of his seven Tour de France titles, and given a lifetime ban from participating in cycling competitions or any other sport over which USADA has jurisdiction. Armstrong predictably denied all charges, but opted not to appeal the decision. From then until now, he has steadfastly maintained his innocence. Why is Lance Armstrong now reportedly considering confessing to doping, when he has so much to lose legally and financially? Perhaps he is hoping to re-enter the sports world. Perhaps his conscience is getting the better of him. Perhaps he is concerned about the effects of all the negative publicity on the Livestrong Foundation, which he founded in 1997 to provide support for people affected by cancer. (Armstrong is himself a cancer survivor.) Or perhaps he is bowing to the sheer weight of evidence and public outcry against him. Perhaps he no longer feels the love from the public. On October 2, 1996, at age 25, Armstrong was diagnosed with an advanced cancer. He underwent a series of operations and chemotherapy treatments, and by February, 1997, he was declared cancer-free. From 1999 to 2005, Armstrong dominated the sport of bicycle racing, winning the top-level Tour de France race an astonishing seven times in a row. 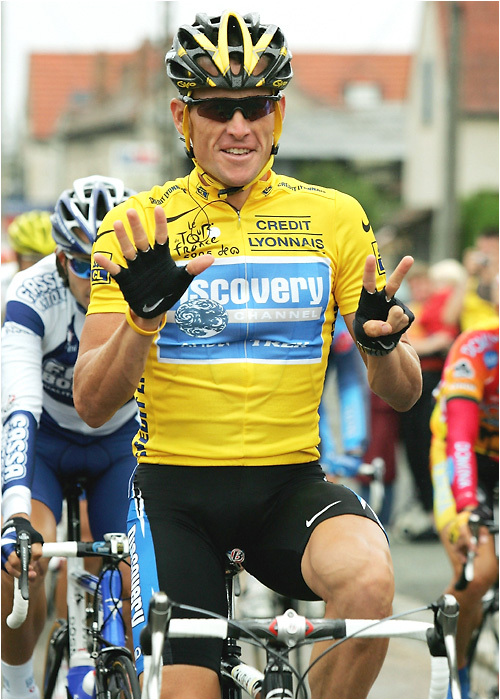 From 1999 to 2012, Armstrong successfully fought off increasingly loud and persistent allegations of doping. However, with USADA’s August 2012 report, Armstrong began to lose the battle he had previously been winning. Though he still has his defenders, the world is turning against him. In this particular battle, he appears poised to admit defeat. Now the real battle against the world begins. Because while appearing like a winner outwardly, Armstrong had previously been losing the inner battle against the world. The world can be a powerful opponent. It offers wealth, pleasure, fame, and success—which are heady aphrodisiacs for the human psyche. The world also offers many illicit short-cuts to achieving these coveted perks for ourselves. Back in the late 1990s, Lance Armstrong succumbed to the lure of the world’s illicit shortcut to victory, success, wealth, and fame in his chosen sport of cycling. He saw that doping was the speedy way to the top. And he was aware that he would likely be competing against others who engaged in doping. The lure of joining the pack of dopers and rocketing to the top was too much for him. He gave in, and made the same deal with the devil that so many other sports figures have made. In so doing, he devalued his own spirit. Like the Faustian bargains of folklore, the modern-day deals with the devil of doping offer the promise of quick success in the short term. But they come with a heavy price tag in the long term. Lance Armstrong’s sophisticated doping regime enabled him, backed by his “U.S. Postal” team of cyclists, to achieve what had been an unsurpassed winning streak: seven Tour de France wins in a row. Yet the victory turned out to be hollow. Now stripped of his winning titles and disgraced in the public eye, Armstrong must live with the consequences of a choice he made many years ago as a young man to secretly flout the rules and deceive the public in order to quickly achieve great success. Instead of his name being synonymous with a heroic and successful battle against cancer leading to legendary success in the field of cycling, the name Lance Armstrong has now become synonymous with achieving false success through cheating, lying, and fraud. This personal “hell” is the heavy long-term price tag of Armstrong’s earlier deal with the devil. However, unlike the poor souls in the Faustian tales of yore, Armstrong has not irrevocably sold his soul into an eternity of torture in hell. He is still living on this earth. He still has a road to redemption. An admission to his doping and an apology for the harm his choices and his actions have caused, if sincere, would be the start of that road. Making restitution to those he defrauded would be the next step. After that, it would be a long, slow struggle upward to redemption and rehabilitation in the eyes of society, and in the recesses of Lance Armstrong’s own soul. Of course, he would have to commit himself to staying clean for the rest of his life. But beyond that, he would have to devote the rest of his life to serving and helping others rather than to building up his own fame and fortune. That’s a choice for Armstrong himself to make. And there are many twists and turns on the road to redemption. Who’s the boss? Lance Armstrong or the world? Despite the religious language, none of this is meant to imply that the world is inherently evil, as many religions proclaim. The world, too, is created by God. When it was first created, everything in the world was proclaimed “very good” (Genesis 1:31). Think of the world as a finely crafted racing bicycle, and the human spirit as its rider. What would happen if the rider stopped pedaling and steering, and let the bicycle take charge? Without direction and power from its rider, the very best we could hope for is that the bicycle would coast downhill until it reached the bottom, and then fall over. More likely, it would quickly run off the road and crash, damaging both itself and its rider. One thing we can be very sure of: it would not travel up any hills or mountains. If the bicycle were to take charge at any point in the Tour de France, that would be the end of the race for that cyclist. Like a bicycle, the world has a certain inertia to it . . . and a certain tendency to go downward into disorder and chaos—or in scientific terms, toward maximum entropy—unless some outside force is acting on it. The world is not evil. It’s just lazy. If the world is in charge, it will choose what looks like the easiest path to pleasure. Unfortunately, that is a downward path toward death and destruction. A bicycle needs a human rider to power it and direct it in the way it should go. The rider must be the master of the bicycle, and not the reverse. Just so, the world needs intelligent and wise human beings telling it what to do, powering it along a proper course, and being its master. The path to redemption means showing the world who’s boss. Are we riding the world, or is the world riding us? When the world is the master and we are the servant, we are on a downward course. This is when the world falls from its original God-created state of being “very good,” and becomes evil instead. In his younger years, Lance Armstrong succumbed to the lure of the world. He let himself and his life be mastered by the promise of fast, spectacular victory, and the wealth and fame that follow in the heels of such victory. The question for Lance Armstrong now is this: can he put his human spirit (and ultimately, God) first, and make the world into his servant rather than his master? Instead of being driven by the fame and fortune of the world, can he use the fame and fortune he has achieved to serve higher goals—goals that involve helping and serving humanity? Each one of us faces this same question in our own lives.